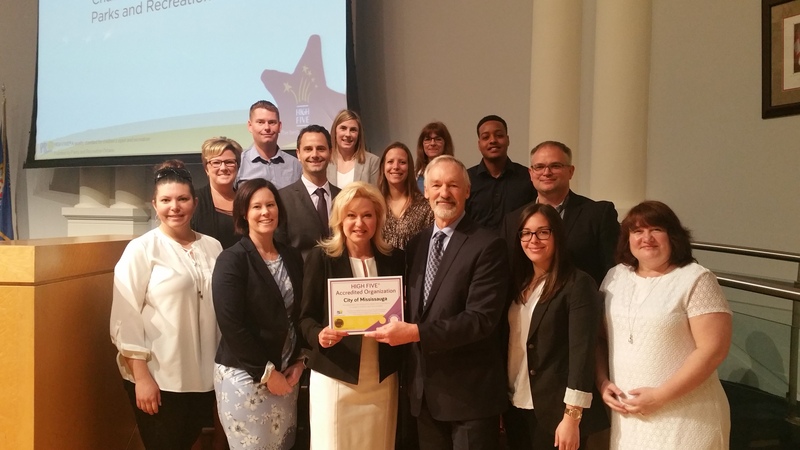 Today at General Committee, staff from the City’s Recreation Division announced that the City of Mississauga received its HIGH FIVE® Accreditation from Parks and Recreation Ontario (PRO). HIGH FIVE is Canada's only national accreditation framework that promotes quality standards for children's sports and recreation. It offers a holistic approach to child development based on years of research and validated by experts in related fields. • review and develop processes, procedures and policies. For more information about the City’s sports and recreational programs and activities, visit mississauga.ca/recreation. • Training and Development – comprehensive training for all staff levels in the area of healthy child development – from front line instructors working with children to supervisors and managers responsible for staff supervision and procedures and policy development respectively. • Program Assessments – tools and practices to observe, assess and support front line instructor’s interactions with children in recreation programs. • Policies and Procedures – continuous improvement systems that support the implementation of nationally recognised quality assurance practices leading to accreditation. • Branding and Promotion – to parents about the organization’s pursuit and attainment of nationally recognized accreditation for providing quality children’s recreation programs.